"More leg!" Julia Nickerson's riding instructor called as Julia neared the low vertical. 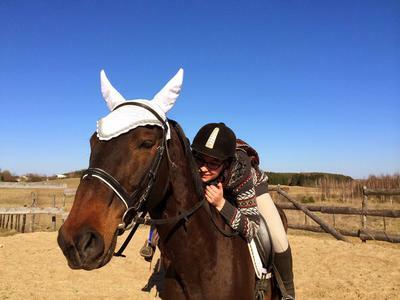 Julia shortened the reins of the chestnut OTTB gelding Sunny and settled into two-point. She gave him a little leg and straightened him up as he lifted his forelegs and popped over the jump. Julia cantered smoothy out of the jump and pointed Sunny towards the next jump a medium height oxer. She once again got into two-point and flew over the jump like it was a cross-rail. "Good boy!" Julia exclaimed giving Sunny a nice big pat on the neck. She slowed him to a walk smiling and walked over to stand by the other riders in the lesson. "That was amazing!" Her best friend Kaelyn Anderson exclaimed as she walked her horse Foxy over to Julia and Sunny. "Thanks!" Julia said grinning broadly. "But all the thanks goes to Sunny," she said leaning down to give him a hug. "That horse can hardly make it over that tiny little oxer! Silver Dream can jump three times as high as that nag!" Amber Richardson, a girl with perfectly strata teeth, blond hair, and a huge attitude sneered as she guided her tall, athletic dapple grey thoroughbred gelding past them as she headed towards the arena gate along with the other riders. "No one asked you." Julia remarked as she slid off of Sunny and led him towards the gate. "Sunny is the best horse ever." "You did so amazing in the lesson today!" Julia said to Sunny as she wiped him down with the sweat scraper after a well-deserved bath. Even though Sunny wasn't legally Julia's horse, she was welcome to bathe him and hand graze him after her lessons for as long as she liked. She usually stayed at the barn for about 4 hours including her lesson once a week and she also came to help out at the barn on Saturdays. "Why don't you start riding another horse?" Julia didn't even have to look to know it was Amber. "I mean look at him. He can't jump over 3'6, he's OTTB which explains how fast he is, and he's chestnut. Who wants a grubby old chestnut gelding?" Julia unclipped Sunny's cross ties and started to lead him out of the main barn. "I don't care how high he can jump, how fast he is or his color. He's my best friend and my partner and that's all I care about." She said and led Sunny out to the pasture.